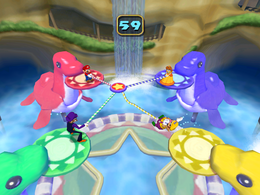 Tug-o-Dorrie is a button mashing Battle minigame found in Mario Party 5. It features the appearance of four plastic-looking Dorries. The name is a pun on a game named "Tug-of-war." The game consists of four players facing each other on high platforms held by giant plastic Dorries. Each player is holding a rope and all the ropes are connected in the middle to a bumper-like object. A player is eliminated if he or she is pulled off the platform by the others. Because the ropes are all connected in the middle, each player's pull affects all other players. The last player standing wins. However, if there are three or two players still standing after the timer runs out, they all win. If there are all four players remaining, the match is a draw. Rules – "Pull your opponents off of their platforms by tugging on a rope. The last player remaining on his or her platform wins." Advice – "When the platforms move, you can't tug on your rope. Use this chance to rest!" French Tire-toi d'là! Pun with an expression meaning "Get outta here!" and Tire meaning "Pull"
This page was last edited on December 16, 2017, at 09:24.